Boy's circular knitted cap with a brim decorated with slashes. The wool has turned brown with age. 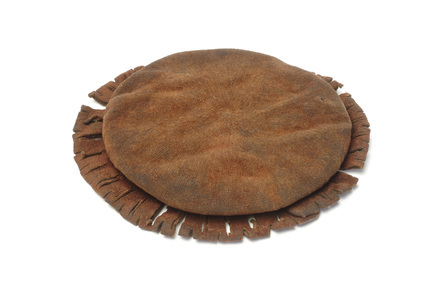 Knitted and felted caps of this type were worn by London's business and working communities. They were designed to be warm and waterproof. A range of styles and qualities were available to suit the taste and pocket of the customer. This cap has a decoratively slashed brim, a style that was especially popular. Bright colours such as blue or red were common, as were black and dark brown.